This a Shanghai street food, in translation this is called 'two yellow faces' (or two sides brown). This noodle dish makes excellent lunch. Cook like a stuffed pancake. Outside crispy inside soft and filled with a meat and vegetable filling. Very easy to make. Best noodles to use are those fresh thin noodles available from Chinese supermarket. Boil half kettle of water, loosen the noodles put in a large bowl. Pour boiling water in, stir then drain. Lift the noodles up and down till no more steam coming out. Season the noodles with soy sauce and drizzle of sesame oil. Leave aside. Season the pork with soy sauce, sesame oil and ground pepper. Cut and prepare the vegetables. In a non stick fry pan, put in a small drizzle of oil and add the garlic, stir till fragrant add pork and mushrooms, add carrot and bamboo shoots (if using). Cook till carrot slightly soften. Heat off add spring onion. Take the filling out, leave aside. 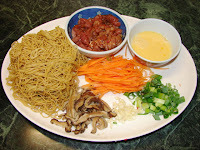 Put about 2 - 3 tsp of oil, evening coating the pan, add 1/2 the noodles in spreading evening. Then spread the filling evenly on top of the noodles. Spread the rest of the noodles on top or the filling. Fried till the underside is brown and crispy. Take a large plate and turn the pancake onto the plate. Add another 2 - 3 tsp of oil on the frying pan and return the pancake onto the pan uncooked side down. Cook till brown and crispy. Then pour the beaten egg along the edge evenly and let it brown. Then ready to plate up. 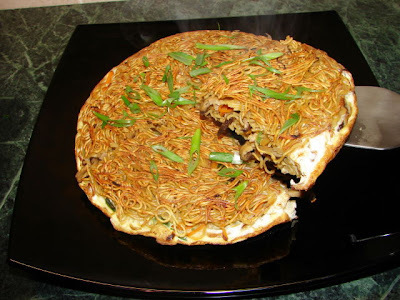 Can top pancake with some chinese green vegetable or just a sprinkling of spring onion. For a vegetarian version, leave out the pork sub with chinese pickle vegetable or puffy tofu. If you don't eat egg leave it out. Sunflower this looks great. Ive been planning the next 4 weeks meals (going on hol and trying to get rid of stuff in the freezer) and I will definatley make this.